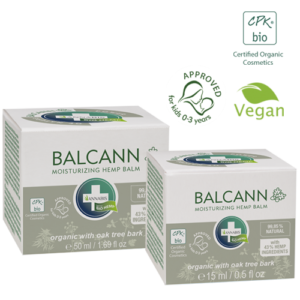 Organic Balcann hemp balm, with a high content of Omega 3-6 unsaturated fatty acids and a unique combination of botanicals, effectively nourishes and soothes the skin. 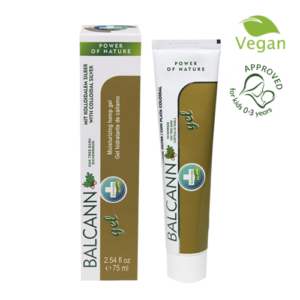 The balm is intended primarily for topical application on the elbows, knees and heels. If used regularly, visibly improves the overall condition of the skin. Hemp balm offers complementary care of the skin for both, adults and children, suitable for all skin types, including sensitive. Each application should be preceded by gentle washing and drying of the skin. After soothing of the affected area, you can treat your skin with other Annabis skin care products. Available in 2 sizes – the small one can easily be carried around with you to be always available. Approved for children 0-3 years and is Vegan friendly. Recommended use: The balm can be applied repeatedly throughout the day as needed. Ingredients (INCI): Olea Europaea Fruit Oil, Cannabis Sativa Seed Oil, Glyceryl Stearate, Cannabis Sativa Seed Extract, Tocopherol, Helianthus Annuus Hybrid Oil, Humulus Lupulus Oil, Ethyl Ferulate, Amyris Balsamifera Bark Oil, Cedrus Atlantika Bark Oil, Lavandula Angustifolia Oil, Myrtus Communis Leaf Oil, Linalool, Limonene.